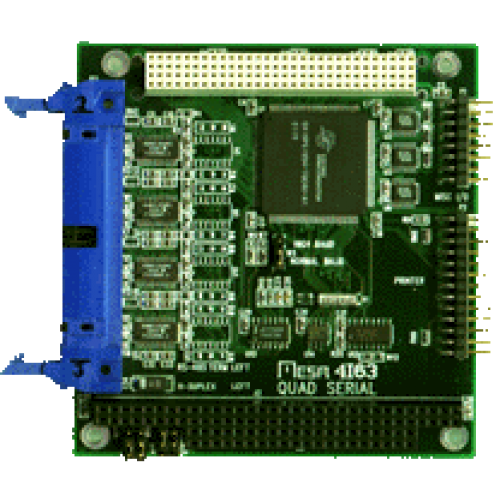 The 4I63 is a high performance, four channel asynchronous serial port on a stackable PC/104-PLUS PCI bus card. Since it is a PCI based serial card, it has lower transfer overhead than ISA PC/104 based cards and can support more channels at higher baud rates. The 4I63 is available in three versions: quad RS-232, quad RS-422/485, and a model with two RS-232 and two RS-422/485 channels. The 4I63 is similar to the 4I32 but is PCI based. The 4I63s UARTs have 128 byte receive and transmit FIFOs for lower interrupt overhead or to support higher baud rates. Baud rates up to 9216K baud are supported with RS-422 or RS-485, and up to 230.4K baud with RS-232. The new UARTS also support automatic hardware or software flow control. Automatic direction control is provided for half duplex RS-485 type applications. The 4I63 is provided with W9X/NT/W2000 drivers and is supported by Linux, FreeBSD and NetBSD. The 4I63 can be operated in full duplex or half duplex RS-485 mode. Both RS-232 and RS-422/485 interface chips have 15KV ESD protection to prevent static damage. Serial port connections are terminated in a 40 pin latching header. The pinout is designed so that a flat cable from the 4I63 can easily be terminated with four IDC DB9 type connectors giving the standard AT serial port pinout. The 4I63 also provides a standard printer port and 11 uncommited I/O bits. The 4I63 requires only +5V for operation, as all RS-232 power is generated on card.